I cant remember....are the Red Hoodies from the Tour Merch tents different than the Red Hoodies in the shop? Agreed. There is no inspiration in it at all. A 5 year old could do that. Let's Just Pop a Few Yards of Bubble Wrap and Call It a Day! Any news on other new stuff? Wristband colors? Show specific hat? 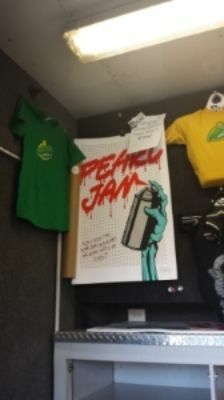 in light of that god awful seattle poster.....is there an "approval" process by either the band or by one of their "people"? :? shoulda told the seattle "artist," "try again." now, back to my question....^^^^^ :?